Earlier this week I looked at three comic book series from The New 52, and found that the first issue of each wasn’t very newbie-friendly, contrary to what DC had advertised. Let’s analyse three more titles today and assess their jumping-on adequacy. Website: still no series information at DC. A lot of people seem to like this series, or more precisely, J. H. Williams’s art. I for one found it too sexploitative even by mainstream superhero comics standards, and consequently didn’t bother to read Batwoman past this first issue. The story starts with a supernatural crime case which both Batwoman and the Gotham City Police Department try to solve. Intercut are some scenes of Batwoman training her sidekick, and of a mysterious organisation that is probably more prominently featured in later issues. This setup is straightforward enough to grasp the basics of this setting, but then again there are many references to previous events, such as the double page on which Batwoman talks to her father about the past, with a background filled with scenes that are inscrutable for the new reader. 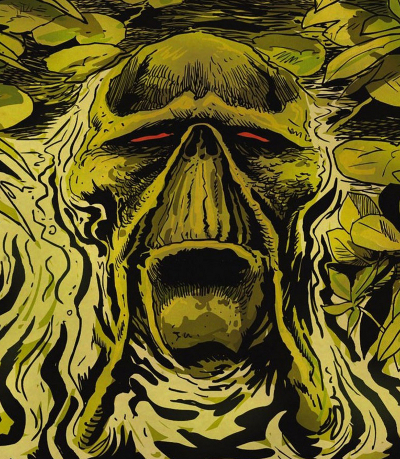 As I’ve written in my previous reviews of this series, Scott Snyder doesn’t make it clear right away whether or not protagonist Alec Holland really is the Swamp Thing. In his dialogue with Superman, Holland says that he once was Swamp Thing but has renounced this superhero identity. At the end of this issue, Holland and the Swamp Thing (or ‘a’ Swamp Thing) are in fact shown as two distinct figures talking to each other. Again, past events are referenced heavily in this book, but this time, it feels more like a deliberate, clever element of ambiguity, rather than as if you’re missing out on something if you haven’t read all previous Swamp Thing comics. For those readers already familiar with Swamp Thing, there are several easter eggs to be discovered in the drawings in the form of fictitious company names on labels which pay tribute to the original Swamp Thing creators. I’ve already written about the art of this series in a previous post, but let’s focus on the story here: as in some of the other comics, mysterious supernatural things happen, and superheroes investigate. The Justice League fails, though, and the clairvoyant Madame Xanadu assembles a team that is more apt to deal with mystical threats – the eponymous Justice League Dark (although that name isn’t used here). Thus, this first issue is a typical team origin story. Each member is introduced briefly and we learn about their respective powers, except for Deadman, who is only featured on two panels for the time being. This book requires some basic knowledge of the Justice League, e.g. Zatanna’s affiliation. More importantly, the Justice League members refer to the villain, the Enchantress, as a familiar figure, although new readers probably won’t have heard of her. To sum up, hardly any of the six New 52 number ones I’ve read are particularly good jumping-on points. This is mainly due to the editorial decision to maintain the status quo: if you have all these characters and their backstories and their established settings and back-up casts, why not continue to use them? Any major change would have angered the old readers, and DC didn’t want to risk that. That’s why their comics are still not attractive for new readers. Apparently, DC’s business strategy is to hold on to the old readers and make them buy as many comics as possible, which is why they let “crossover mania” break out in each New 52 title. Before too long, the continuity of the DC universe will be so messed up again that the next half-hearted “reboot” will be necessary to unravel it. Eventually, the target audience won’t take note anymore. Previously in Swamp Thing: by the time I wrote my last review, Alec Holland was about to turn into the Swamp Thing, and the series was about to get really good. Back in issue #7, the series still seemed to be going in the right direction. With the help of the Parliament of Trees and his “bio-restorative formula”, Alec Holland is finally transformed and emerges from a giant cabbage as the Swamp Thing. The artwork by Yanick Paquette leaves little to be desired. This pattern is repeated in issue #9: the first 8 pages are drawn by Paquette, the remaining 12 by Rudy. This constant back-and-forth between those two artists is annoying, but at this point, their styles had grown so similar that I almost didn’t mind anymore. A lot of mystical, epic fighting takes place in this comic book. With issue #10, a completely different artist, Francesco Francavilla, takes over (including the colouring). While Francavilla is by no means a bad artist, his style is such a far cry from Paquette’s and Rudy’s that one cannot help but notice the difference and wonder why. Especially since in issue #11, Rudy is back as the artist. What was Paquette doing in those 2 1/2 months when he apparently wasn’t drawing Swamp Thing? In fact, the next Swamp Thing issue with Paquette as artist will be #13, which is scheduled for October. I couldn’t find a statement from DC that explained what makes this merry-go-round of artists necessary. Apart from being irritating for the reader, I can’t imagine Eisner and Harvey award-winning writer Scott Snyder is fond of constantly working with fill-in collaborators. This situation is telling about DC’s attitude towards its authors. The last straw came in issue #12 with the start of the dreaded Animal Man crossover story (“Rotworld”). In fact, this issue is part two of a two-part “prologue” to said storyline, the first part being Animal Man #12. Crossovers that require you to read every single tie-in issue to keep up with what’s going on are a clumsy attempt increase the sales of each involved series, and it doesn’t work with me. I have tried to get into Animal Man before, but didn’t like Steve Pugh’s art, so I don’t feel like picking it up now. Neither am I interested in seeing other characters from the DC universe make guest appearances in Swamp Thing (which will happen in issue #13). So I won’t be reading Swamp Thing anymore. By means of crossover mania and artist roulette (which DC intends to keep spinning), DC has killed a strong series. Still, it was worth reading for most of its first year, both as a DC universe comic that does without (regular) superheroes, as well as for the intricate ways in which it refers to the pre-relaunch era. Thus the first trade paperback, collecting #1-7 and coming out this month, might be of general interest. For me, however, there are more interesting comic books being published by DC at the moment – more on those in later posts. Previously in Swamp Thing: Alec Holland is the Swamp Thing, the Knight of the Green… or is he? Scott Snyder doesn’t really answer that question, in what I assume is an attempt to both pay tribute to and at the same time break away from Swamp Thing’s backstory. Issue #3 shifts the main focus to a new character, a hospitalized boy named William who becomes the first villain of the series. Things get more creepy from here on. In the Alec Holland storyline, we see him using his power to manipulate plants for the first time, and there’s a nice one-page flashback to happier times for Swamp Thing and his lover Abigail (i.e. a tribute to the earlier series). Although only Snyder and Yanick Paquette are credited on the cover, more than half of this issue is actually drawn by Victor Ibáñez (! ), which could be the reason why I liked the art a little bit better than in the first two issues. In issue #4, Marco Rudy suddenly takes over as penciller, and there are three different inkers now. These changes in the art team are highly irritating, but in itself the art isn’t bad. There’s some more nasty horror in William’s storyline, whereas Alec learns about the epic and mystical background of the Swamp Thing. Paquette returns as penciller and inker in issue #5, and now I remember what I like about him: his inking is really striking. While I don’t care much for his heavy crosshatching, his outlines, which can be up to about 3mm thick in a close-up, are daring. A third storyline about an evil scientist/occultist in the Amazon Jungle is introduced here, and Alec Holland shows off some more of his Swamp Thing powers in a battle against William. The artist carousel revolves once more and brings us Marco Rudy again as the penciller and inker for issue #6. I’m not saying Rudy is a worse (or better) artist than Paquette, but I wish they’d let me get used to either of them. Apart from that, this is the darkest, most atmospheric and probably best issue of the series so far.